Te Matakite, the sub-seafloor observatory we are installing in the Hikurangi Subducton zone, is not the only observatory in the world in a subduction margin, but it is a first for New Zealand. And because of its nested design, with three packages of instruments lowered inside each other, it is one of the most complex. There are observatories under the sea floor in other parts of the world, but most are at mid-ocean ridges where tectonic plates are diverging or pulling apart. Some subduction zone observatories have been installed off the coasts of Costa Rica, Japan, Cascadia, Barbados and the Marianas (in the northwest Pacific Ocean), and they are giving scientists interesting insights. In Costa Rica, an observatory at ODP Site 1255 has shown that the chemistry and flow of subseafloor fluids changes following slip events on the subduction fault. These data were recorded by an OsmoSampler and OsmoFlowmeter that measure the fluid-flow rates and fluid chemistry, much like the one we are installing here at Site U1518. 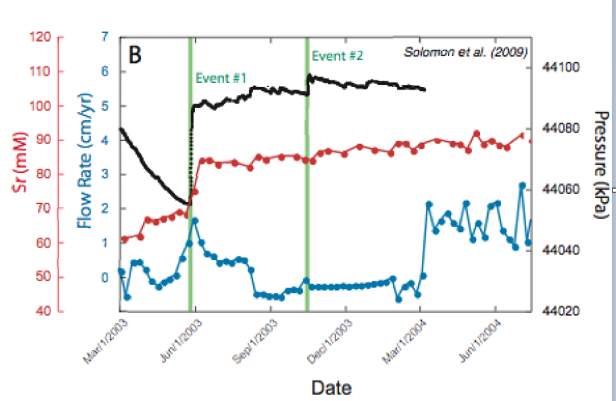 Data from Solomon et al. (2008) shows a marked increase in fluid pressure (black line) after two slow slip events in Costa Rica, as well as changes in the flow rate (blue line) and fluctuations in Strontium (Sr) indicated by the red line. Strontium is like a fingerprint giving us an idea of where the sub-seafloor groundwater is coming from. In Japan’s Nankai Subduction Zone, pressure sensors have shown a difference in fluid pressure changes at two different sites during slow slip events. These pressure changes happen between Hole C0002G (blue) where the sediment is getting ‘tugged’ to the right (and the fluid pressure decreases) and Hole C0010A (red) where the sediment is getting ‘squeezed’ (and the fluid pressure increases). The observatory we are installing here, east of Gisborne in the North Island of New Zealand, will be able to detect similar slight changes in the rock and sediment surrounding the subduction fault and provide clues about how and where stress is building or being relieved. Seismic reflection image of the studied slow slip area where opposing fluid pressure changes have been gathered from CORK observatories at two sites (C0002G and C0010A) on the Nankai Subduction Zone (offshore Tokyo). Image from Araki, Saffer et al., 2017.